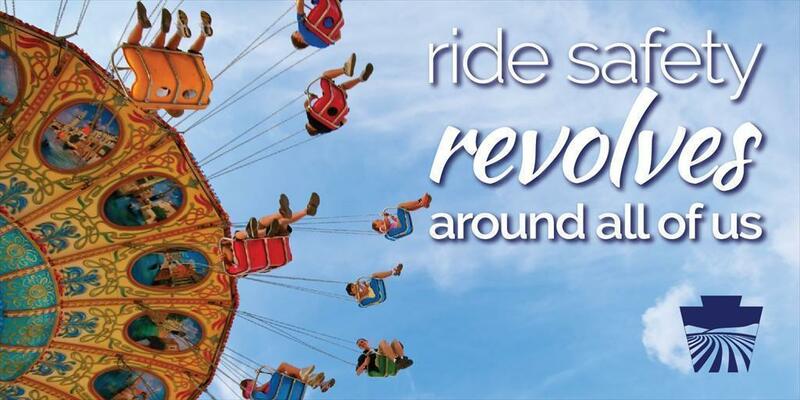 Ride Safety: It Revolves Around All of Us! ​Amusement ride season has begun as parks open and festivals and fairs get underway across Pennsylvania! The Department of Agriculture’s Division of Amusement Rides and Attractions registers over 9,300 individual amusement rides and attractions annually that are enjoyed by millions of Pennsylvanians each year. While we want you to have fun on these attractions, we also want you to play it safe. Look for the Commonwealth of Pennsylvania registration plate mounted on the ride (with the tcurrent a current calendar year decal “2017), and the public notice sign that reports it has been inspected to meet Pennsylvania’s Ride Safety Act standards. Follow instructions by keeping your arms, feet and legs inside the ride and don’t add your own thrills! Always remain on the ride until it comes to a complete stop. Use safety equipment to keep you and your child safe! Whether equipped with seat belts, shoulder harnesses, a lap bar or lap chains, they must be worn to provide safety. Know your child’s capabilities and assume an active role in determining if a ride is appropriate for the child. Watch the ride in operation before you allow your child to ride. Make sure your child can ride it safely. Observe the ride operator for alertness. Their job is the to be aware of the ride operation and how of patrons reactions. Explain to your child about appropriate behavior while on the ride. Keep hands and feet inside, sit down, use seat belts and safety equipment and obey the operator’s instructions. Ask the operator to stop the ride if you see that your child is crying or shows any other signs of distress. We also ask that if you see something, you say something! If you have ride safety concerns report them​ to the department immediately.